Please excuse my lack of self-control while I share all the strawberry recipes with you all at once. I can’t keep these recipes to myself! The strawberries are talking to me at this point. They like to be soaked in gin, they say. 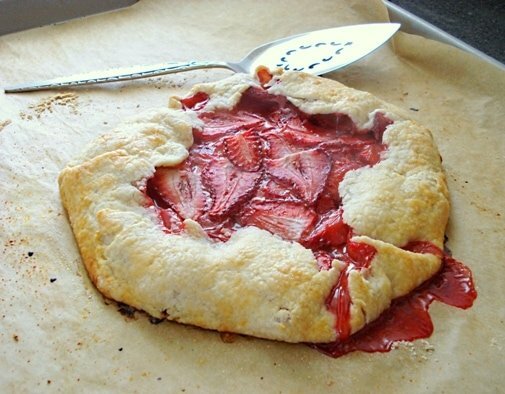 One of the early recipes on my site is a strawberry crostata made with rose water. My Mom made the recipe many times without the rose water, and then finally bought a bottle. Now, she says, she’ll hardly make a strawberry dessert without it. I made this cocktail with gin, because I’m currently having a scandalous love affair with local gin, but vodka would be fabulous, too. If you’re not a fan of the herbal flavors of gin, you’ll appreciate vodka in this application. I’m amazed that rose water is able to stand up to the herbs and floral notes of gin, so I’ll stick with it. Yikes! Ok, final words: I like this cocktail with only one teaspoon of sugar, but if you like super sweet and fruity cocktails, go ahead and use two. First, wash and de-stem the strawberries. Next, dice the strawberries into small pieces, like 12 pieces from one berry. Tiny. Sprinkle the sugar over the top of the strawberries. Let sit for 5 minutes. Then, mash the strawberries with a fork to release their juices. Fill a cocktail shaker with ice, and then add the strawberry mixture, gin, rose water and a pinch of salt (just trust me). Shake, then divide between two glasses. I’ve only ever had rosewater with coconut before (also amazing) but am I every so glad right now that I have strawberries in the fridge and a mostly full bottle of rosewater in my life. Oh yes. I am. These are GORGEOUS! I need them in my life. Is it 5 o clock yet? I’m not usually a Gin person…but i’ll try it for these beauties! Don’t mind me while I move my clock ahead so I can go ahead and have this NOW! I’ve never had rose water. This drink looks so refreshing! Must try it! 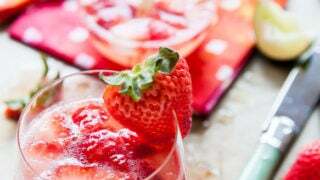 There’s a gin sold in the UK called Bloom, which you drink with strawberries, so it might be a winner for this recipe. If it includes gin I’m totally in! You should see my gin collection right now. I need to throw a gin party just to make a dent. Love the addition of rose water in this…yum! Waaaaaaant!! Man, this looks awesome. So yummy! This is so charming! I feel it should become the official ‘cocktail for spring’. So original! Gin and strawberries and rose water.. OMG.. I’m really feelin this drink girlfriend! What a tasty and refreshing cocktail. It looks pretty too! The crostata also looks amazing. using rose water sounds soo good. i have used it in the past for my skin but never with food or drinks. Strawberries and gin? Count me in! I adore strawberries and rosewater so these sound fabulous! Keep all the strawberry goodness coming! I just went grocery shopping and was stunned by how beautiful the berries looked! 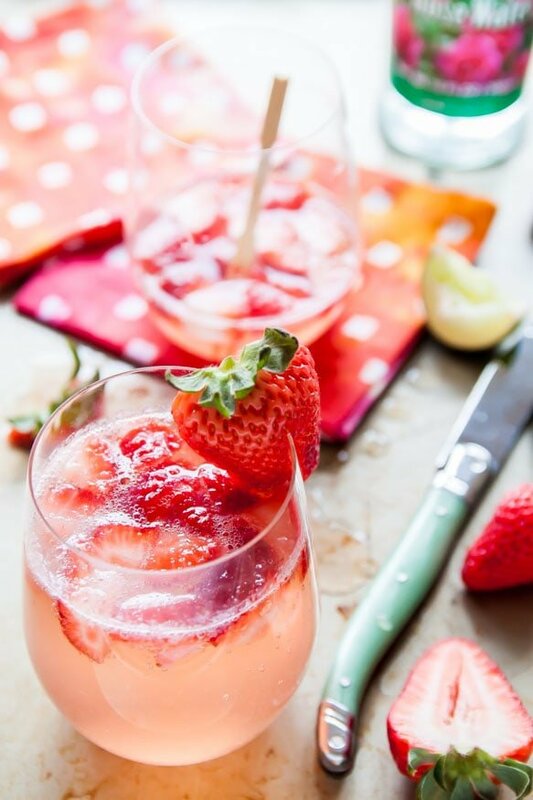 I am ready for more strawberry recipes and more ginny gin gin goodness! BAH. I knewww we would have a disagreement at some point! You’re talking to a vodka woman right here, but I think we can compromise on my substitute :) and umm that crostata? don’t shade your old pics, that looks totally fab! did I see gin??? yum….. I bet this cocktail would be awesome for a get together outside on a nice evening! Weee, four shots of gin. Holy cow, I love it! 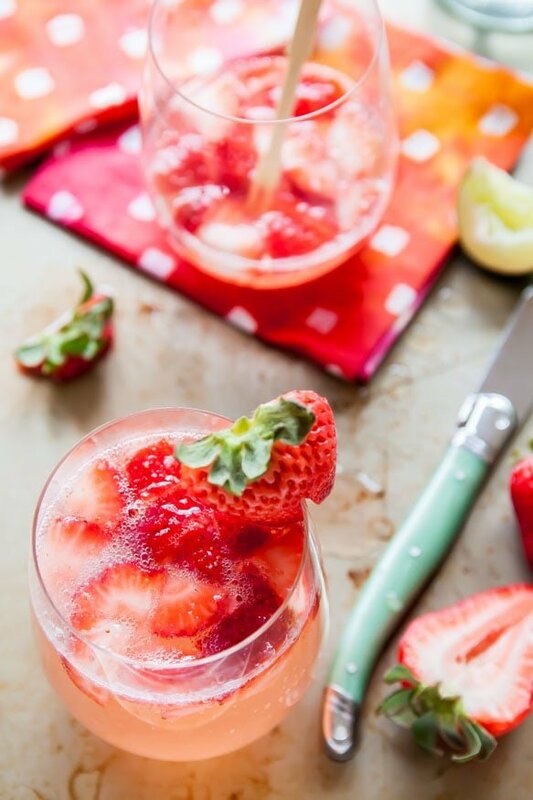 Gin is my jam, and so are strawberries. Pinning. I think I’m going to have to go hunt down some rose water this weekend. This gin fizz looks fabulous! I didn’t even read this before pinning it (I did read it, too). Gawwwgeous. I cannot wait to try these! Beautiful color and perfect for spring!